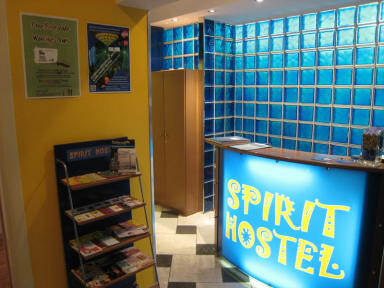 Spirit Hostel i Beograd, Serbia: Bestill nå! Group booking have to be confirmed by an email, 7 days prior to arrival. Otherwise complete booking will be cancelled. Group bookings can be made only for dorms. Private rooms can not be booked for group bookings. FREE PARKING-We provide free secured parking for our guests. Parking space is limited, so please book your parking lot directly by email, immediately upon booking of room! Spirit Hostel is elegant, comfortable and cozy hostel & apartments property in the heart of the Belgrade, and in its oldest part Dorcol. We open our doors in November 2009. If you want to discover the hospitality of Belgrade, charming and magnificent city of great night life, reach history and good looking and kind people, Spirit Hostel is the perfect starting point. Our quiet, but yet centrally located Hostel offers you relaxed and friendly atmosphere, great facilities and numerous free items, perfect cleanness and kind staff, that will make you feel like home. Out location enables you to reach the main city attractions on foot. Take a walk and discover Knez Mihajlova street - pedestrian zone and shopping paradise (12-15 min on foot), famous bar and restaurant street Strahinjica Bana popularly called Silicon valley (5 min), Kalemegdan - medieval fortress and park (5 min), Belgrade Zoo (3 min) and riverbank of the Danube river - popular Belgrade quay 25. May, with floating water bars and restaurants, bicycle track and sports centre (3 min). In our closest neighborhood, you can find all the necessary items for comfortable stay in Belgrade! You will get INCLUDED in a room rate linen, towels and room slippers, large safety lockers, in room music, reading lamps. You just have to ask, and we will provide iron and ironing board, hair dryer, maps and brochures and all the possible tips and suggestions, baggage keeping in safety room and much more! Note that smoking is NOT allowed in a hostel, but we have a really nice outside balcony area. IMPORTANT: We don't have a permanent reception! Check in is between 12:00h and 23:00h. Early/Late check in/check out is possible, but with advance notification. Just email us in advance before the arrival date. Check-out is between 07:30h and 11:00h.